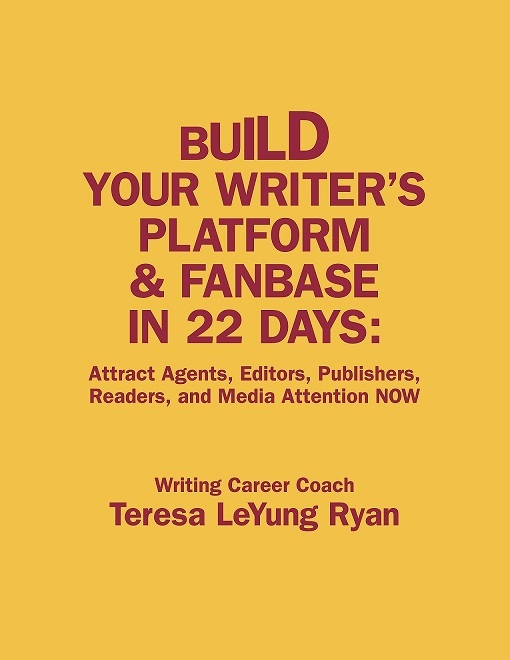 Coach Teresa, Is Your Build Your Writer’s Platform & Fanbase Workbook Available? 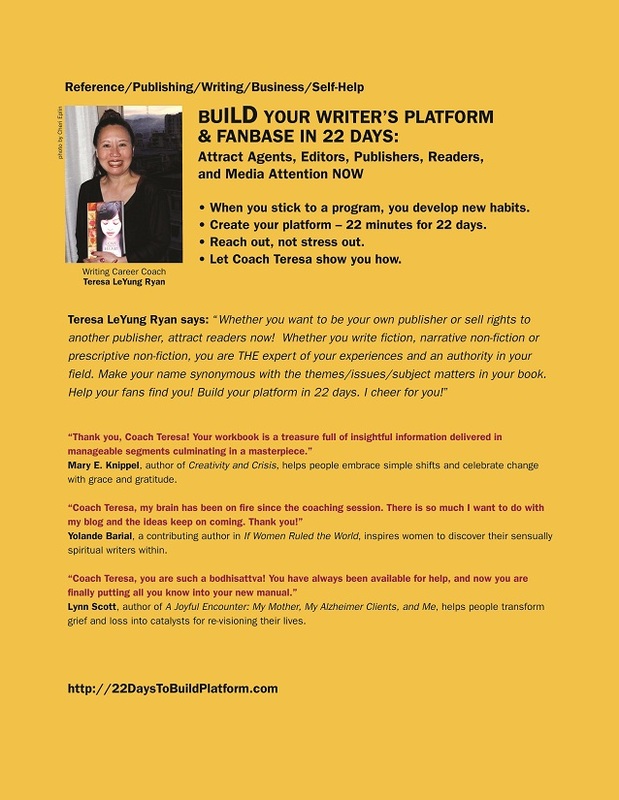 Coach Teresa, is your Build Your Writer’s Platform & Fanbase In 22 Days workbook available? Yes, through Amazon. I am so pleased with the reviews writers have been sending me. Please write your reviews on Amazon. For the writers who are building their names, click on the title-bar of this post to get the comment box. Tell the world what your resolutions are for this month or year. Olga Malyj, my first healthy role model, orchestrated the lovely party today. A month ago, I had told Olga that I wanted a women’s networking, wish-making, potluck gathering. She made it happen; the women who showed up brought beautiful foods, their powerful spirits, and their wishes for the year. I will be adding to this post in the days to come. 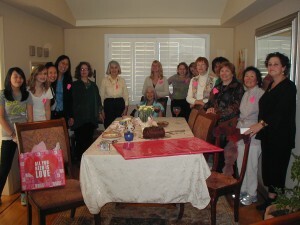 On Tuesday, March 16th 2010 , in celebration of Women’s History Month, Writers’ Sanctuary presents visionary author Mary Cox Garner; award-winning author Luisa Adams; author and writing career coach Teresa LeYung Ryan; and international plot consultant Martha Alderson. This program is aimed at people that have a love of words, a book in their head, and are seeking methods of putting their ideas on paper, and developing a story with the potential to become a publish book. Mary Cox Garner, author of The Hidden Souls of Words: Keys to Transformation Through the Power of Words http://www.hiddensoulsofwords.com/ In 1995, Mary Cox Garner established a foundation, HOPE, INC., which continues to address both the material and spiritual needs of children and their care givers. She lives with her husband in Washington, D.C., and has three grown sons. Luisa Adams, author of Woven of Water http://rp-author.com/Adams/ Luisa Adams is an award winning writer, educator, workshop leader, and Licensed Brain Gym® Consultant. She is the mother of five, grandmother of eight, and resides with her husband, Dave, in San Mateo, California when not living by the enchanted lake. To listen to “Writers’ Sanctuary” blog talk radio show hosted by Kim McMillon, click on: http://www.blogtalkradio.com/onword/2010/03/16/writers-sanctuary-hosted-by-kim-mcmillon Mary Cox Garner, Luisa Adams, Teresa LeYung Ryan, Martha Alderson shared insights and posed questions; the show was aired on March 16, 2010 11:30am-1:30pm and is now archived. Saturday, March 06, 2010 My dear friend author Lynn Scott http://lynnscott.wordpress.com/ fed me a lovely meal today; then she critiqued my letter to Ms. Glenn Close and said exactly what I needed to hear. Lynn reminded me to speak from my heart. Thank you, Lynn! You and I speak the same powerful mission statement. Your riveting article “Mental Illness: the Stigmas of Silence” for The Huffington Post http://www.huffingtonpost.com/glenn-close/mental-illness-the-stigma_b_328591.html, especially revealing the truth about the original ending of Fatal Attraction, and your comment about how “certain words have power over us” in your Aha! Moment for Oprah http://www.oprah.com/spirit/Glenn-Closes-Aha-Moment touch me deeply. Your delivery of Iris in The Natural has inspired me to be “a good woman.” Picturing you as Iris (a calm tower of strength) and reading about your confronting mental illness in your family gave me the inspiration to present my book Love Made of Heart to you. I was 27 years old when my mother came to visit me and my sister (we were sharing an apartment). She moved in without any discussions. In our apartment, our mother plotted her way to end her misery. Please accept my book as my expression of gratitude to you for speaking openly and unabashedly about the suffering that your loved ones and you endured. I can see your face when I read the lines spoken by Dr. Gloria Thatcher, the compassionate psychologist in Love Made of Heart. As an author and a community spirit, I, Teresa LeYung Ryan, use my novel Love Made of Heart to shed light on stigmas suffered by women, men and children with mental illness/traumas to the mind. I speak out openly for those who cannot speak for themselves. www.BringChange2Mind.org 1 in 6 adults and almost 1 in 10 children suffer from a diagnosable mental illness.